We bought this cookbook for the cover. Really, we did. It is a book about meringues. Who among us hasn't made meringues. My Mother loved them. She, unfortunately, never made the clear connection between the humidity outside and the outcome of the meringues. There meringues are not my mother's meringues. Here's the back story. Two young cooking school grads decide to team up and go on a cooking show to take a product from the kitchen to the marketplace, but, alas they have no product. Cupcakes have been done...and done and done anddoneanddoneanddone. Then there were cake pops and cookie pops and pie pops and well, pie. Then Alex Hoffler and Stacey O'Gorman thought of the simple meringue. They perfected a meringue. 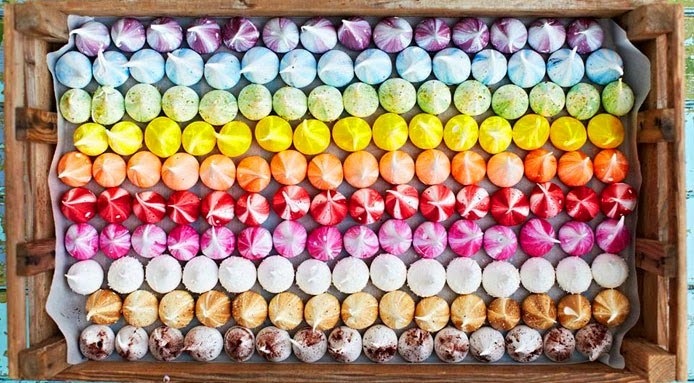 Made it bite-sized, gave it exceptional flavors, and then made it beautiful and The Meringue Girls were born. 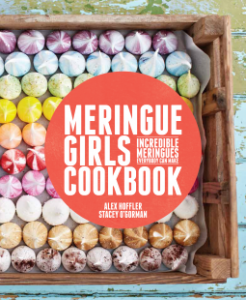 Soon after, The Meringue Girls Cookbook was born. The biggest complaint about the book is about the book. That is, its a book about meringues. There are people out there who complain that it is a book about meringues. Basically a two ingredient one-trick pony. you would not be complaining. Start by lining a large baking sheet with baking paperLine a deep tray with baking paper and heat 300g caster sugar at 200C until the edges are just beginning to melt. Heating the sugar helps it to dissolve in the egg white more quickly, creating a glossy and more stable mixture.Now, turn the oven down to 100C. Add egg whites to clean bowl of a stand mixer. At first whisk slowly allowing small stabilizing bubbles to form, then increase the speed until the egg whites form medium peaks.Using a large spoon, add the sugar spoon by spoon while continuing to whisk. It is ready once you have a full bodied, stiff and glossy mixture (about 5 minutes). 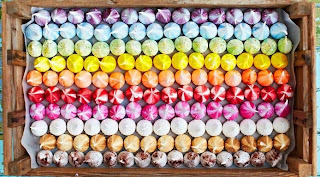 Turn a disposable piping bag inside out, and use a paintbrush to paint stripes of natural food colouring on the inside. Fill the piping bag ensuring there are no air bubbles, and cut the tip off to the size of a 20p piece. Pipe small kisses onto a lined baking tray. Bake for 30-40 minutes. Its good to keep our meringues mallowy and soft in the middle, so take them out of the oven as soon as they lift off the baking paper with the base intact. The Meringue Girls offer up a detailed, three page version for their meringue, so you will need the book. Remember my Mother? This is my Mother's recipe in grams. She use a cup of egg whites and two cups of sugar. She made them for years; every Christmas, Thanksgiving and Easter. One in every four batches screwed up. Yes, there are only 2 ingredients, but it is trickier than one might think. My Mother made vanilla meringues. Sometimes she added pecans. That was it. But the world of meringuey goodness is as vast one one's imagination. So grab a copy and get creative. Remember, one only needs two ingredients! *Update. Had a formatting problem! hope we worked it out. It took me years to figure out humidity versus meringue. I probably invented new cuss words trying to get the toppings for lemon pies to turn out. My grandmother left me a recipe for sally anns, a cakey ginger cookie with a sugar-and-meringue icing that should harden into a puffy glaze. Except that if you live in southeast Texas, it almost certainly won't. I got it to work once, on an uncommonly cold, dry, day. Sigh.